Virok can accommodate a very wide age group. Structured according to zones, it can be used by many children at once despite its limited space requirement of approx. 10 x 10 metres. The Virok system incorporates many of the Explore universe’s play activities, for example the kitchen and stove, which encourage role-playing. 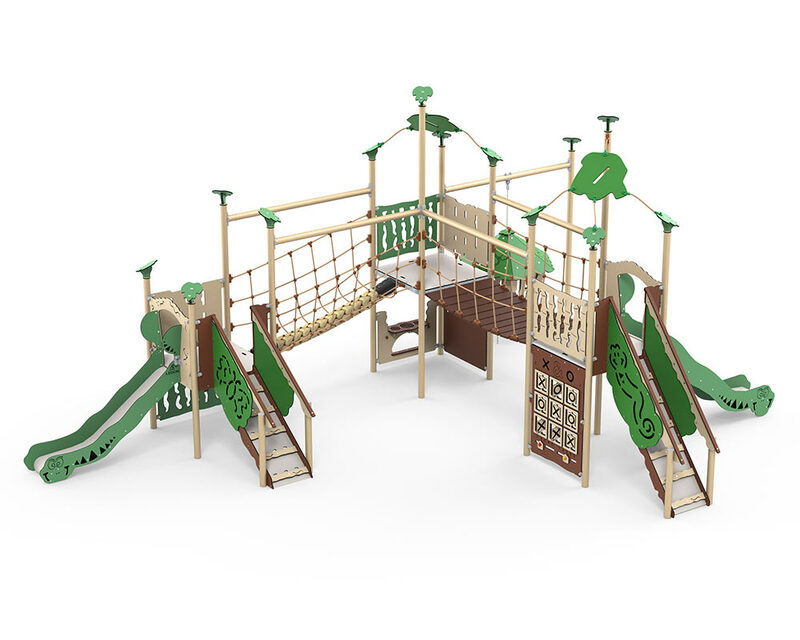 The Virok system also features the swinging jungle hut, suspension bridges, tic-tac-toe as well as the two slides. Even though it’s designed for energetic play, it is still safe. All the floors are finished with a specially developed cubit-grain non-slip surface. For many years, tic-tac-toe – or noughts and crosses as it is otherwise known – has been a popular children’s game; in fact, it is one of the most-played games worldwide. Now the game has been brought to the playground as part of the Virok play system. At the bottom of the play panel is the scoring scale – who will win the first five games? The pieces are designed with rounded edges so they are comfortable to touch.